XML has been accepted as a universal format for data inter- change and publication. In applications such as web warehousing, data in XML format (XML data) from the web needs to be extracted and in- tegrated. 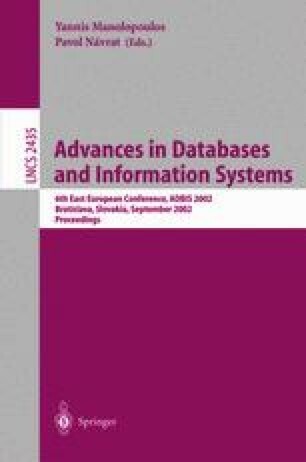 In this paper, we study extracting XML data from XML data sources in XSL. To avoid the complexities in defining templates in XSL, we define a pattern definition language. Extraction patterns can be de- fined in the language without dealing with the procedural phase of the XSL language. A defined pattern can be translated to an XSLT query in an automatic manne using the algorithms that we propose in the paper. Sharon Adler, Anders Berglund, Jeff Caruso, Stephen Deach, Paul Grosso, Eduardo Gutentag, Alex Milowski, Scott Parnell, Jeremy Richman, and Steve Zilles. Extensible stylesheet language (xsl)version 1.0. Technical report, 2000. http://www.w3.org/TR/2000/WD-xsl-20000327. Geert Jan Bex, Sebastian Maneth, and Frank Neven. Expressive power of xslt. http://citeseer.nj.nec.com/bex00expressive.html. Tim Bray, Jean Paoli, and C.M. Sperberg-McQueen. Extensible markup language (xml)1.0. Technical report, http://www.w3.org/TR/1998/REC-xml-19980210, 1998. Alin Deutsch, Mary Fernandez, Daniela Florescu, Alon Levy, and Dan Suciu. Xml-ql: a query language for xml. Technical report, http://www.w3.org/TR/1998/NOTE-xml-ql-19980819, 1998.